Don't get me wrong, I adore my husband to the moon and back, but quality time with your closest girlfriends is sometimes completely neccessary. And while I'm always down for a bottle of a wine and a good chat sesh, Rachael Ellen's idea of a girl's party has got me totally wanting to plan my own. Like stat. Captured by the talented Brooke Stapleton, this color palette is girly meets glam. For this shoot, Rachel shared with me that she wanted to inspire brides to simply take a break from the stress of wedding planning and to remind them to just have fun. From the event designer, "I chose to use shades of pink, red, and gray with gold accents. I think pink and red gets a bad rap but together they can actually look strikingly modern"
Fun details to be on the look out for: big balloons, a donut tower, candy kabobs, and even a Beyonce dance party! Oh, and did I mention these pretty outfits? Okay, i'll admit it. I'm totally turning on Cyndi Lauper's "girls just wanna have fun" and I'm about to have a mini dance party in my living room. Just one peek at these pretty pics and I'm thinking you might be inspired to join me! Are you dancing yet? Goodness. It looks like fun was had by all! And that's what I love about girl time. So what are you waiting for? Start planning an impromptu girl's night for you and your bridesmaids to enjoy! It doesn't have to be elaborate. Some sweet treats and a little quality time really does make for the best memories! Oh, and don't forget the music. Dance parties are the best! 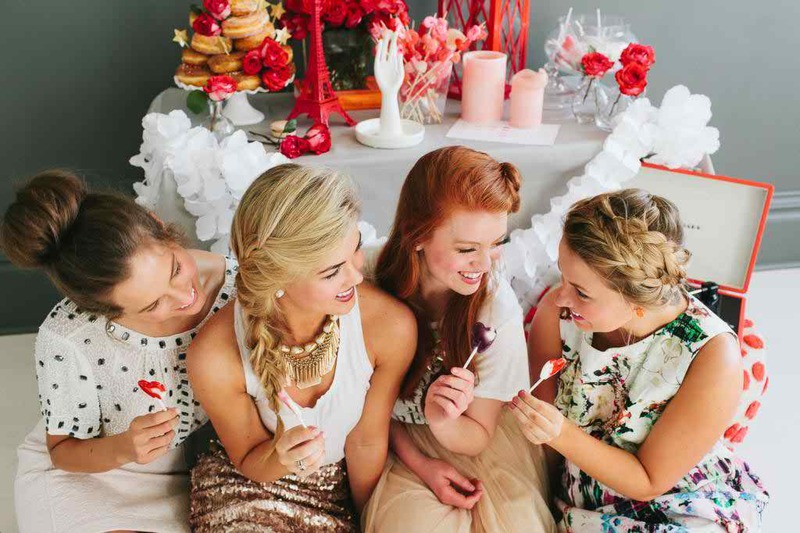 13 Comments " Girls Just Wanna Have Fun | Styled Shoot "
This is the sweetest party! I love each of the outfits - just the perfect amount of sparkle! Where is this sequined maxi skirt from??!!! Too cute! Those outfits are gorgeous! I love this styled shoot! Looks like fun and the girl's emerald beaded shirt is amazing!